Tetra’s owner Charlie bought a whopping 5,400 balls – and they want more. What’s more exciting to a dog than a ball? 5,400 balls, obviously. 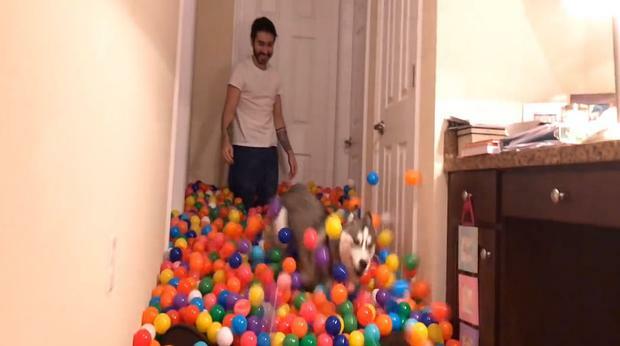 That’s what YouTuber Charlie, also known by his channel name penguinz0, treated his dog Tetra to – after he turned his home’s hallway into a ball pit. Just as a warning, there is some strong language in this clip. It sounds like the young husky pup is happy with her new play area too – in fact Charlie said she goes “berserk”. “When she sees the hallway, it’s like a kid on Christmas looking at a brand new bike,” Charlie told the Press Association. “The main issue with having the ball pit hallway is getting Tetra away from it. “Not even Thanos with all six infinity stones could get her out when she’s in there. “A problem with the hallway is the sound when she’s in there wreaking havoc,” added Charlie. Charlie is a gaming commentator with more than two million subscribers to his YouTube channel, popular for his dry sense of humour. Oh, and in case you thought the ball pit renovation was temporary, think again. “Yeah, we still have all the balls,” he said. “But it seems the gluttonous urge for more has taken over. “My girlfriend is fighting the urge to get more from other Toys R Us locations so 5,400 may be just the beginning. Apart from watching Tetra play, Charlie said another benefit of the ball pit is the “stylish means of transportation” it provides. “I’ve placed a boogie board near the start of it to use as a surfing device to get from the start to the bathroom at the other end. If you’d like to see more of Tetra, check out her Instagram, or if you’d like to hear more from Charlie try out his YouTube channel.